That's how much Sherman McCray owed his homeowner association when the board of directors foreclosed on his Clermont house. Of course, the debt wasn't just $338.91 by the time a Lake County judge on Jan. 3 ordered the 81-year-old Korean War veteran's home sold. On March 13, McCray's house is to be sold to pay the debt, and the retired long-haul trucker who uses a wheelchair most of the time will be thrown out, along with his graying Labrador retriever named Mac. 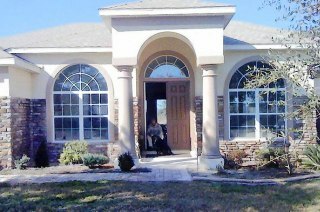 Sherman McCray's house in Clermont that has been foreclosed on. McCray still can't believe it. Amidst a series of illnesses ranging from a heart attack to a gallbladder removal -- and the bills that come with such conditions -- McCray didn't make one of the payments. Soon, a full-blown dispute was raging. When the tab had run up to $2,394.62, he agreed to pay $100 a month. But every time he talked with association's lawyer or got a new letter, the amount he owed keep going up, up, up. How could this be? He didn't get it. McCray, a member of the Teamsters union and an avid pianist, was dubious about what was going on, so he balked on taking care of that one old assessment. He paid new ones, however. McCray said he didn't get a lawyer to represent him because he didn't have the money. He never dreamed a homeowner association made up of his neighbors could possibly have the power to take away his life's investment over such a paltry sum. Instead, he poured out his feelings in a hand-scrawled letter of frustration and explanation to the court. "I am a Korean veteran," McCray wrote. "My grandmother was born in this country. Who could be more American than me? He said he doesn't deserve to lose his home, "which I have worked all my adult life for." The Orlando lawyers for the Vistas homeowner association eviscerated McCray's passionate response in a quick motion for a final foreclosure order. The judge, Terry Neal, must follow Florida law, so like it or not, she granted the foreclosure. That's what happens when even a smart person takes on the legal system without professional help. McCray, after all, is just a guy who thought that in the United States, taking away someone's home was reserved for the most extreme of situations, such as defaulting on a mortgage. McCray's mortgage, however, is paid up. So are his taxes -- paid at the earliest opportunity, in fact. "I don't understand it. I never seen a situation like this in all my life," said the Chicago native, who is twice widowed. "Nobody didn't give me this house. I bought it with blood, sweat and tears." Sickening tales of diabolical, petty homeowner associations in South Florida are legion. But here in Lake County? Why would the board of directors exercise a punitive option against an elderly disabled veteran obviously overwhelmed by health troubles and without a thorough understanding of the rules? They could have chosen to solve this a dozen other ways, and they should have. Mary Goldin, president of the Vistas Homeowner Association, didn't respond to a request to explain. A man who peered through a crack in the door at her home refused to provide a way to get in touch with her. Robert Case, the association's lawyer, wouldn't talk about the case either, saying it was ongoing. Here are a few things McCray didn't know and that led him to conclude that he was being ripped off: Under Florida law, a homeowner who doesn't pay an assessment from his association will be charged 18 percent annual interest, which continues to accrue, along with the lawyer fees for the association attorneys, fees for putting a lien on the house, pre-judgment costs and the price of a title search as the case heads toward foreclosure. • In addition, as McCray continued to pay, that money by law went toward the thousands that he owed for the missed assessment, not toward the current fees as he assumed. That means he instantly was "behind" on all the new payments, which of course triggered a fresh round of late fees and threatening letters penned by expensive lawyers. Told of the way the system works, McCray was stunned. "At that rate, I would never be able to pay it," he said. The law isn't designed to help a struggling homeowner hang onto the house. Rather, it's set up to make money for lawyers whose fees are guaranteed when the house is sold in a foreclosure, said Evan McKenzie, a former homeowner association lawyer and an associate professor of political science at the University of Illinois at Chicago. He is a nationally recognized expert in aggressive homeowner associations. "The law needs to be changed so that associations can foreclose only for what is owed them. The lawyer should get his fees through another mechanism," McKenzie said. If that were the case, attorneys wouldn't be so eager to foreclose, he said, and wouldn't be advising their clients to do so. How often does this happen in Lake County? Neal, one of three county judges, said she sees two to four cases every month in which homeowner associations have foreclosed to collect fees. However, the vast majority involve homeowners who can't afford to keep their houses and aren't paying their mortgages, either. Last week, she ordered a home sold during a hearing which the owners didn't bother to show up. Faced with the certainty of losing his home, McCray finally hired a lawyer. Orlando lawyer Michael Valverde said he is working to save McCray's house before the sale date, but he wouldn't say what he intends to do. McCray has 30 days to appeal the judgment, but the matter also could be solved by McCray paying off the debt. He says he doesn't have the cash. "It was one thing after another, and I just ignored it," McCray said. "I shouldn't have. I just didn't think that could be legal."